It’s hard to believe I painted this six years ago, and just a month into my daily sketching. I know this style was one I’d visualized, but never worked in the way I envisioned when I worked freehand. This sketch has been very popular as a card and print, and as much as I see things I don’t like, its simple authenticity in capturing the moment, my actual stumbling around with ink and watercolor, is what makes it work. On that day I’d photographed them and remembered standing there with the sketch building in my mind, pretty much as you see above. But could I do it? No, I had no confidence it would turn out any differently than prior attempts, which had all been oversketched and then muddy when I added the watercolors. All I could see were my failures. But it was too strong of an idea. I decided to at least try a sketch, after all, that was why I’d decided to do my daily sketches, to experiment, practice and perfect styles I’d wanted to use. I got a watercolor pad anticipating the watercolor added later, a drawing pen, and started to sketch. A little bit of practice goes a long way—though I’d only been daily sketching for about a month after not completing much art at all for a year or two, I had regained enough control to be able to work this out quickly with just a bit of adjustment. As you see there is an extra outline of their ears and heads as I’d begun them a little larger, then as I worked my way down their sides I tightened up my lines and their bodies were a little smaller so I resketched their heads to match. What to do with the lines? Leave them there. They are part of the sketch. Black cats, like white cats, have all sorts of colors in their fur, and in filtered sunlight their fur glistened with all sorts of highlights and shadows. The randomly shaped and wrinkled red blanket heightened the range of colors in their fur and even the neutral wood floor held random combinations in its old unfinished grain. Mostly, the composition was what attracted me in the first place: two similar heavy rounded shapes, the random soft shape and the smooth shape brought elements together in a very pleasing way. I think cats are very aware of how they can create beautiful compositions simply by being in them. Sometimes I’m not sure which way to go with an idea. Part of my quandary was that I had two ideas, this one of ink lines with watercolor and another of black sumi-style cats on a solid red blanket, just absolutely simple shapes. I think I’ll also do that one, but I’ll do it from the photographs I took. (N.B. I never did that, but came close to it with other sketches of them on the red blanket). You may recognize this as being similar to a few of the images in today’s (January 6, 2012) photo, “Mimi Photobomb“, and that’s exactly what I was doing before I was photographing—sketching in ink the view from behind which I found absolutely dear. 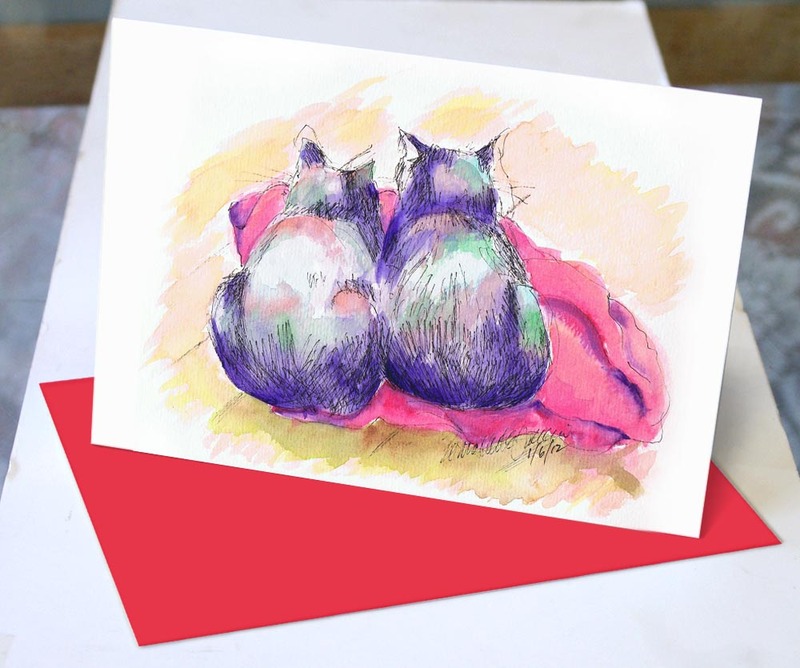 Normally I would have moved into my studio and gotten the watercolors immediately, but then I saw the photo op and spent some time on that, and then the phone rang, and it was getting late in the day and I was still in my bathrobe and all I’d done was sketch and photograph my cats. Fun and fulfilling, but it doesn’t pay the bills. Interesting and funny what I wrote then! But I’m so glad I took that time to work through this idea. This sketch led me in a new direction I’d always wanted to go, ink sketch with watercolor washes, and if you enjoy my daily sketches you’ll know that it’s one I use frequently in many sizes. This was also the first daily sketch I sold as an original and was made into a Valentine and all-purpose greeting card by request, and I also sell it as a digital print and a mousepad! If at all possible, always follow your ideas to their logical end—or to quote Robert Frost, take the road less traveled, by yourself or others!